Obesity Is Officially a Disease, So Why Was My Child Diagnosed as a 'Healthy Eater'? My daughter doesn't think her diet is "special." To her, it's normal. She eats a wide variety of fruits and vegetables throughout the day. What message does it send to tell my daughter that to eat "healthy food," she needs to get her snack at the camp nurse every afternoon? Today, the American Medical Association officially diagnosed obesity as a disease. 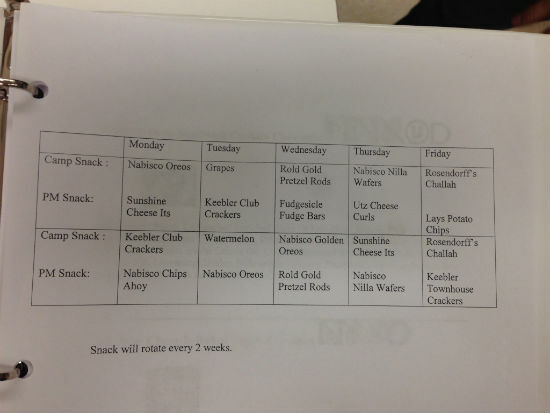 So why is my daughter's summer camp sending her to the nurse for being a "healthy eater"? Next week, my 5-year-old daughter starts summer camp for the first time. As I sat in the parent orientation meeting, the camp director laid out the great activities she will do and reviewed some new data from the American Camp Association (ACA) on the benefits of camp for children. According to the ACA website, "building blocks of self-esteem are belonging, learning, and contributing. Camps offer unique opportunities for children to succeed in these three vital areas." It all sounded fantastic -- until I saw the snack menu. At 3:15 p.m. every day, the camp provides a "camp snack" to all the children (ages range from 5- to 15-years-old). Considering the children swim twice a day and have outdoor play as well as dance and sports almost daily, they need a snack that provides them with energy and carries them from lunch to dinner. So what is the camp offering? A daily choice of Oreos, Chips Ahoy, Nilla wafers, Cheese Curls, and potato chips. It's not like the camp has never heard of fruit; they are serving watermelon or grapes once a week. Could they possibly think that these artificial, highly-sweetened, and highly-processed foods are filling, nutritious, and appropriate to serve growing children? I talked to the head counselor, and explained that we try to eat "real food" that is both satisfying and nourishing, and I was worried about both the poor quality of the "food" they were serving as well as how little satisfaction it would actually provide. She sent me to the woman in charge of the snacks, who was very kind and sent me to the head of the camp, who was also understanding and sent me to camp nurse. The nurse said I could send in whatever snacks I wanted for my daughter. She would store them in her office, and my daughter could come and get them every afternoon. And my friend, whose daughter must follow a gluten-free diet, told me our children could come together to get their daily snacks! And then it hit me: eating "healthy" snacks is being treated like a disease. The camp was very happy to accommodate our "special" needs and reassured me that with all the allergies today, our daughter wouldn't be the only one eating a "special" diet. My daughter, who is not overweight, doesn't think her diet is "special." To her, it's normal. She eats a wide variety of fruits and vegetables throughout the day. She loves to snack on carrots, raw peppers and hummus, and no one has told her that this is "special." What message does it send to tell my daughter that to eat "healthy food," she needs to get her snack at the camp nurse every afternoon? How ironic that a summer camp that is supposed to promote self-esteem and inclusiveness can do neither because a child has the rare affliction of wanting to eat healthily. Yet in a country in which nearly one in three children is overweight or obese and in which French fries are considered a vegetable, it's no wonder that the little girl who eats carrots and not cheese curls is "special." When I asked the head of my daughter's camp if any other parent complained, I expected that there would be several. After all, this is a wealthy suburb outside a cosmopolitan city with more Whole Foods than Food Lions. But the camp director told me that only one or two parents a year comment on the camp menu. We send our children to camp and trust that the counselors and lifeguards will keep them safe, from the pool to the buses used for field trips. Shouldn't a camp also have an obligation to keep our children safe at the snack table? Singling out a child whose parents are trying to teach her to care for her body and eat real food makes my job, as her parent, much harder and doesn't do much to support the efforts of other parents who may be trying and struggling to do the same. Given what we know about junk food, and its impact on our health, shouldn't our summer camps -- and schools -- help normalize the eating of healthy food, not exclude a child from the group just because she prefers to snack on whole foods? And it's not that children won't eat these foods. In the work that we do at First Bites, we have seen preschoolers learn and love to make healthy smoothies, try new fruit, and -- yes -- even eat their broccoli. It's that it's the job of all of us -- parents as well as schools, summer camps, and after-school programs -- to set the example and offer the right choices to our kids. It may cost a little more than Chips Ahoy or be more of a hassle to cut a piece of fresh fruit, but it's the price we will need to pay to tackle the real disease plaguing our kids, obesity. Visit First Bites and join the First Bites community on Facebook and Twitter for more information about kids' health habits and nutrition.